Lessons are typically held weekly following the yearly calendar that is published on the studio website. Please be on time for your lesson and when picking up your child. Lesson start and end times will be based on the scheduled lesson time, not the arrival time of the student. For example, if your lesson is from 4:00pm-5:00pm and you come at 4:15, the lesson will still end at 5:00pm. This insures that lesson appointments will stay on schedule. Please do not arrive more than a few minutes before your lesson time or pick your child up more than 5 minutes late. Bonus group classes are held at least once each semester. The bonus group class may serve as “make-ups” for those unavoidable occasions when a student or rarely the teacher, must miss a lesson. For students with perfect attendance these classes are a bonus class. Sign-ups are available online via the My Music Staff portal. Students are expected to continue lessons in the summer months. Students who do not continue lessons in the summer will be added to the studio waiting list. Please enter and exit the studio quietly if other lessons are in session. Please do not knock on the door as this disrupts other lessons. To discuss student progress, parents are welcome to talk with the teacher during the first five minutes of the student’s lesson but not after the lesson, in order to respect the next student’s time-slot. Students are asked to wash their hands before lesson. Please make sure finger nails are trimmed. It is recommended to use a canvas tote bag to carry books to and from lessons. The student will bring an assignment notebook, which will be used to keep track of assigned pieces and practice suggestions/goals for each week. Parents are responsible for purchasing lesson books, metronomes, flashcards, and occasionally other books or materials. The teacher will provide information on how/where to purchase these items. Be certain your piano is tuned and in good condition. It is very discouraging to play on an out-of-tune instrument. Putting off tuning is not cost effective; a piano that is very out of tune will most likely require several tunings over a period of weeks or months to bring it back to pitch. A list of local recommended tuners/technicians are listed on the studio website. If your child is starting on a keyboard it must have 88 keys that are weighted or hammer action and a pedal. Tuition is based on a 9-month period (September-May) and divided into equal monthly payment installments that can be paid with credit card (autopay is available), check, or charter school P.O.s. The studio runs much like a private school; Tuition remains the same each month and is based on enrollment, not attendance, reserving the student’s exclusive lesson time throughout the piano year, whether he/she attends lessons or not. A commitment for a minimum of 1 semester (Fall is 4 months, Spring is 5 months) is required with a one-month written and paid notice before the semester ends should the student decide to discontinue lessons. (Fall Semester: September-December; Spring Semester: Jan- May) Tuition does not change regardless of the actual number of lessons per month (See yearly calendar). This policy covers both semesters for the school year. If the student begins in the fall semester, re-registration in the spring is not necessary. It will be assumed that both Fall and Spring semesters will be taken unless the studio receives your one month notice before the end of the semester. Re-registration for the following year is done every spring and due by May 1st. In order to hold a spot for the Fall, each student must participate in the summer course OR pay the equivalent of such. Tuition is due by the 1st of each month. Checks are payable to “Samara Rice.” There is a 3-day grace period to turn in tuition without penalty. If payment is more than 3 days late, a $15.00 per student late penalty will be added to the invoice. After the 7th of the month, an additional $1.00 per student per day will be added to the late fee. If tuition payments are late more than twice, the student will be asked to pay the full semester’s tuition in advance. There is a $35.00 fee for bounced checks. If a check bounces, payment must be paid in cash before the next lesson. A Non-Refundable $25.00 per student Studio Registration Fee per student is required for each academic year or whenever a student begins lessons. The Studio Fee enables the studio to provide students with loaner music, incentives and rewards throughout the year, theory games, theory sheets, Supersonics music, and other studio licensed music. A student who does not attend a lesson misses the benefit of that lesson. Tuition reserves the student’s weekly time-slot and benefits within the studio. Samara Rice Music uses My Music Staff’s online calendar system to allow students to cancel and then re-book up to 3 lessons per semester, pending availability. Samara Rice Music cannot guarantee any make-ups. Please refer to the “Reschedules Policy” handout for full details. Scheduled make-up lessons that are missed will not be made up. Should 2 people arrive at once, the student booked on the My Music Staff calendar will be taught. If you cannot attend please let the teacher know via a quick text message. If the teacher must miss a lesson, she will call and reschedule with you, or in rare occasions use the bonus lesson. Every student stops taking lessons at some point. Please make this decision thoughtfully with plenty of discussion between the teacher, parent, and student so that lessons can conclude with a positive sense of closure. Because tuition includes much more than the reserved lesson time the studio requires a one-month written and paid notice before the semester ends. The student must finish the remainder of the semester paid in full or forego any unused lessons, as there is no refund given (i.e. Fall Semester: one month notice by Dec. 1st; Spring Semester: one month notice by May 1st). If appropriate, a parent/student teacher conference may be scheduled before the last lesson to establish if this might be a temporary setback that can be resolved. A student may be immediately dismissed at any time for reasons including (but not limited to) those listed below. No refunds will be given. Email or text is the best and preferred way to reach Samara Rice Music. If you need to cancel a lesson at the last minute, please text. Email is checked several times a day. I let the voicemail take calls during lessons. Calls, texts, and emails will be returned during business hours Tuesday through Friday. Samara Rice Music is closed Saturday through Monday. 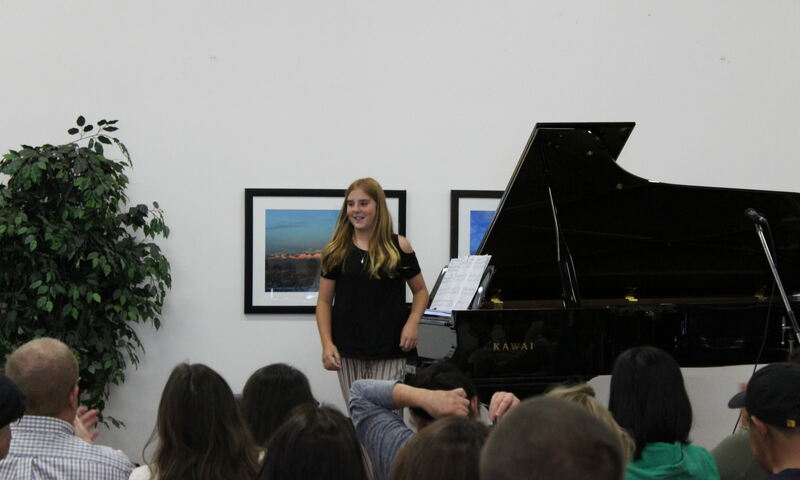 Samara Rice Music and Samara Rice are released from any liabilities, accidents or injuries that may incur from the enrolled student with the participation of piano lessons, group classes, piano parties or piano events. During student and group gatherings and performances the teacher reserves the right to use video recording or to take photographs of students for use in the studio scrapbook, advertising materials, lesson demonstration and studio websites/platforms. Photos taken by the teacher OR that are shared with the teacher by other parents or students of gatherings or performances become the property of the studio and can be used at the discretion of the teacher in regards to the studio. The studio follows online safety rules in this matter.